Fixed speed direct control hoists depend on the control system to manage three phase power to the hoist. Motion Labs’ fixed speed direct control systems are designed to provide phase management, voltage monitoring and electrical current overload protection for those hoists. Direct control hoists utilize chain stops. Our systems operate with a standard handheld remote. 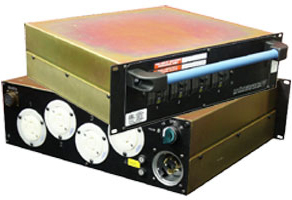 Due to design criteria, direct control systems are housed in 19” rack mountable NEMA 1 enclosures. They are designed in four, eight, or twelve channel configurations. If you need more than twelve channels of control you can put multiple units in a rack and employ a larger hand held remote to control the entire rack. As the hoist cable requires only power, they are usually designed with the appropriately rated twist lock or pin & sleeve connector. As the direct control hoist does not have an allowance for a “pickle”, we can provide a single channel control device for those applications. We can accommodate from one to thirty-two hoists using standard handheld remotes and larger group assignment can be accomplished using HMI touch screen and SCADA technology.